Objectives To develop and validate a scoring tool based on demographic and injecting risk behaviours to identify those who require additional, non-routine serological screening for hepatitis C virus (HCV) by assessing their personal risk. Design Cross-sectional and prospective cohorts. Setting People who inject drugs (PWID) and attended Needle and Syringe Programs (NSP) in Australia during the period from 1998 to 2008. Participants Cross-sectional data included 16 127 PWID who attended NSP in Australia. Prospective data included 215 HCV-negative PWID who were recruited through street-based outreach, methadone clinics in Australia. Primary and secondary outcome measures HCV seroprevalence in the cross-sectional and HCV seroconversions in the prospective data sets. Results Current study included 16 127 PWID who attended NSP in Australia. Type of drug last injected, frequency and duration of injecting, sharing needles and syringes or other injecting equipment and imprisonment history were associated with HCV infection in all age groups. Strong relationships between an individual's ‘HCV score’ and their risk of testing HCV antibody positive were observed. An estimated 78% (95% CI 75% to 81%), 82% (95% CI 80% to 84%), 80% (95% CI 78% to 82%) and 80% (95% CI 77% to 82%) of HCV infections across the age groups (<25, 25–29, 30–39 and ≥40 years) would be avoided if participants in the upper four quintiles of HCV scores fell instead into the lowest quintile. Conclusions Knowledge of HCV status has important implications for public health and care and treatment. Risk assessment strategies may assist in alerting PWID who are at increased risk of HCV infection to present for testing. Although the risk factors for incident infection are well established, the literature suggests that a number of barriers may prevent PWID presenting for screening. Study developed a scoring tool based on demographic and injecting risk behaviours to identify those who require additional, non-routine serological screening for HCV by assessing their personal risk. Current clinical practice guidelines recommend HCV screening of individuals with a history of injecting drugs. However, this recommendation focuses on a single risk factor (ie, injecting drug use), whereas considering the cumulative effect of multiple risk factors among PWID can more precisely identify people in need of additional non-routine screening. Our prediction equation is based on 11 years of data and >16 000 participants. Ideal risk assessment methods or prediction models should be derived from large representative samples. The study population is limited to those who participated in the Australian Needle and Syringe Program Survey, which may result in selection bias. We were not able to differentiate between acute, recent and chronic infections. Worldwide, infection with hepatitis C virus (HCV) is common among people who inject drugs (PWID).1 Estimates suggest that >70% of new cases of HCV infection are associated with injecting drug use.2 3 Epidemiological studies have identified independent risk factors for HCV infection, including sharing of contaminated needles and syringes4–7 and other injecting equipment,8 9 female gender,6 10 duration of injecting11 and intravenous cocaine use.12 13 Although the risk factors for incident infection are well established, the literature suggests that a number of barriers may prevent PWID presenting for screening and many PWID face the possibility of HCV infection with a sense of inevitability, fostered by structural barriers to risk avoidance.14 PWID are a priority population in Australia as HCV prevalence remains high in this group. The burden of advanced liver disease (liver failure and hepatocelluar carcinoma) continues to grow among HCV-infected people.15 It is estimated that 5300 Australians are living with HCV-related cirrhosis, and this figure is expected to double by 2020 without increased therapeutic intervention.16 Despite the mounting burden of disease and recent advances in antiviral treatments, HCV treatment uptake among PWID remains very low (1%–2% of chronic hepatitis C cases).16 A major public health challenge is to more effectively identify individuals with HCV before the development of significant clinical consequences. Our study aimed to develop a scoring tool that can be used by PWID and primary care providers to identify individuals at increased risk of HCV infection. With increasing recognition of the clinical benefits of early diagnosis and treatment uptake,17–19 a simple self-administered tool may provide a means for PWID to identify personal risk and to modify risk behaviour and/or seek healthcare/further assessment. A large database of serial cross-sectional samples of PWID attending Needle and Syringe Programs (NSP) in Australia (1998–2008) was used to develop a statistical model underpinning the tool. Cross-sectional (internal) and prospective (external) validation studies were carried out on the HCV risk assessment algorithm. The following characteristics were considered essential in the development of the new prediction algorithm: (1) the use of routinely available and minimally intrusive variables and (2) estimation of the cumulative effect of concurrent risk factors on the likelihood of HCV prevalence. We are unaware of any studies to date that have quantified the cumulative effect of concurrent risk factors on the acquisition of HCV infection among PWID. Capillary blood was obtained by finger prick using single-use disposable lancets and cotton-fibre blotting paper. Specimens were kept at room temperature at the survey sites, then couriered to a central collection point before they were forwarded to the laboratory. A modified third generation enzyme immunoassay (Abbott hepatitis C 3.0; Chicago, Illinois, USA) was used to test for HCV antibody. A modified cut-off value for optical density was calculated to capture >95% of the seronegative population. Specimens were considered positive for HCV antibody if the optical density to cut-off ratio was ≤1 on initial and subsequent testing. Ethical approval was obtained from the Human Research Ethics Committee (HREC) at the University of New South Wales as well as from relevant jurisdictional and site-specific HRECs. A split-sample method was used to develop and subsequently validate a risk equation and scoring system. Participants were randomly allocated to either the development (n=10 662; 67%) or internal validation (n=5331; 33%) sample data sets. We selected a range of demographic and injecting behaviour variables as potential determinants of HCV infection. These included gender, indigenous status, imprisonment history, country of birth, language spoken at home, drug last injected, frequency and duration of injecting, sharing of needles and syringes and other injecting equipment (eg, water, filter, spoon, tourniquet), public injecting and drug treatment history. All analyses were stratified by age groups (<25, 25–29, 30–39 and ≥40 years). We used descriptive statistics to characterise the groups according to antibody HCV serostatus: mean and SD for continuous variables and percentages for categorical variables. Logistic regression was used to create a predictive model based on the development data set. We used all non-missing observations available in the relevant analyses as only a small proportion of observations had any missing data (except for the variable ‘imprisonment history’). Cox regression analysis was used to validate the scoring tool for HCV seroconversion in external validation set. All analyses were conducted using SAS statistical software V.9.2 (SAS Institute Inc) and STATA V.10.0. Using the development data set (n=10 662), we included a comprehensive list of predictors known to be associated with HCV antibody seropositivity in an initial model. Specifically, we included the main effects of all variables listed in table 1 and their interaction effects. We first analysed the univariate associations between the independent variables and HCV seropositivity. Backward elimination was used to reach the final multivariate model, in which factors with the largest p value were sequentially deleted until only significant predictors remained. We then created a weighted scoring system by rounding all regression coefficients up to the nearest integer (ie, the smallest integer greater than the estimate). This method was based on the β-coefficients (or log of the ORs) rather than ORs, which can be excessively influenced by only a few factors.24–26 Once the final model was defined, we created integer weights for each variable. We calculated these weights by multiplying the model coefficients by 10. Using the rounded weights in the risk function, we estimated the participant-specific probabilities of HCV seropositivity and characterised the degrees of risk based on cut-off points of the probability distribution. We examined the predictive validity of the scoring system using the internal validation data sets (n=5331). We also assessed the predictive validity of this scoring system on the subsequent risk of HCV antibody seroconversion using prospective data collected from individuals who visited ANSPS sites multiple times and tested HCV seronegative at their first visit. We used the cross-sectional data set to check the sensitivity and robustness of the new screening score. We computed standard validation measures: the proportion of antibody HCV seropositive specimens, sensitivity, specificity, positive likelihood and negative likelihood ratio and the area under the receiver operating characteristic curve as discrimination statistics. We also assessed the diagnostic characteristics of different cut-points based on the total score in the development as well as validation data sets. The purpose of this analysis was to assess whether the combination of risk factors under consideration could predict those at increased risk with acceptable accuracy. We have also conducted a prospective external validation study to assess the performance of the scoring system for HCV seroconversion among the new PWID. The details of the study population have been described elsewhere.11 In brief, as part of a multisite study between 1999 and 2002, 215 hepatitis C-seronegative PWID were recruited through street-based outreach, methadone clinics in South Western Sydney and followed-up at 3–6-monthly intervals. Using the Cox regression coefficients in the risk function, the participant-specific probability of HIV seroconversion was estimated. A rule to characterise different degrees of risk based on cut-off points of the probability distribution was then established. We also assessed the diagnostic features and characterised different degrees of risk based on cut-off points of the probability distribution. After we calculated and validated the HCV screening score, we estimated population attributable risks, which estimates the percentage of HCV infections that would not have occurred if all participants had been assigned the ‘lowest risk’ (first quintile) category of the HCV screening score. We calculated population attributable risks using a previously described method27 that was applied to this study design and appropriate for use with multivariable adjusted RRs. Our study population comprised 10 662 individuals in the development data set. Table 1 summarises participant characteristics by HCV antibody serostatus. The overall prevalence of HCV was 51%. HCV seropositive participants tended to be older and more likely to report a longer duration of injecting, heroin as the drug last injected, a history of imprisonment, daily or more frequent injecting, public injecting and sharing needles and syringes and other injecting equipment. Table 2 presents the final multivariate logistic regression model derived from the development data set by age groups. History of imprisonment, duration of injecting (5–9, 10+ years), drug last injected (heroin, cocaine, methadone, morphine, buprenorphine and others), needle and syringe sharing and sharing of ancillary equipment were all significantly associated with increased risk of antibody HCV seropositivity across all age groups. Injecting frequency (daily or more) was determined to be a significant risk factor for those aged <30 years. Female gender was associated with an increased risk of HCV seroprevalence for those younger than 40 years. Indigenous status was a significant predictor for HCV infection among people aged 30–39 years. Drug last injected and duration of injecting each required multiple categories to capture the risk gradient, whereas other risk factors were binary. The risk factors collectively yielded an area under the receiver operating characteristic curve of 0.73 (95% CI 0.70 to 0.76), 0.72 (95% CI 0.70 to 0.75), 0.73 (95% CI 0.70 to 0.76) and 0.66 (95% CI 0.64 to 0.71) for the age groups <25, 25–29, 30–39 and ≥40 years (data not shown). There were no significant interactions between injecting risk behaviours and gender across age groups (data not shown). Table 3 shows the ORs from the logistic regression models and population attributable risks of HCV infection for the quintiles of the risk scores by age groups for the development and validation data sets. There was a linear trend towards increasing HCV infection with increasing score regardless of the age groups in both data sets (trend, p value<0.001). Using the development data set, we estimated population attributable risks (95% CI) for the upper four quintiles of the scores. Results showed that 78% (95% CI 75% to 81%), 82% (95% CI 80% to 84%) and 80% (95% CI 77% to 82%) of HCV infections across the age groups would be avoided if participants in the upper four quintiles of the HCV scores instead fell into the lowest quintile. Results from the validation data set were consistent with those from the development data set (table 3). We also assessed the diagnostic characteristics of cut-points (according to first, second, third and the fourth quintiles in overall population) for total score in the development as well as the validation data sets (table 4). 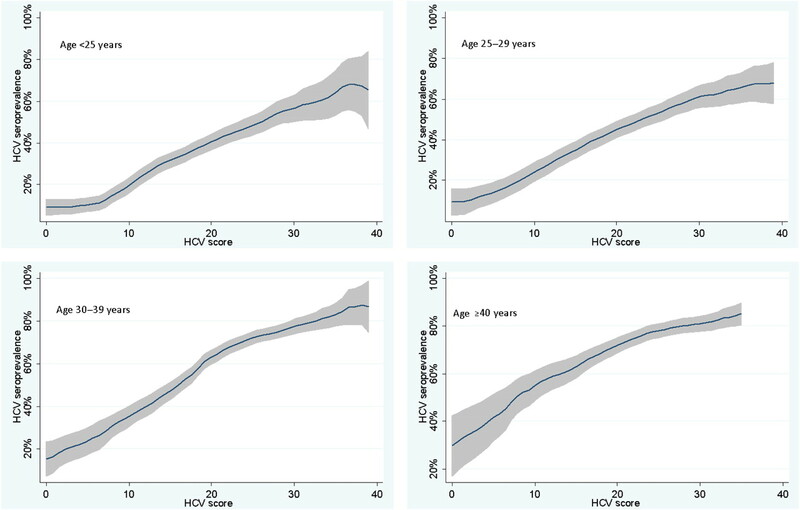 An increased risk of HCV was clearly associated with increasing scores. For example, a cut-point score of 10 or higher distinguished a ‘increased risk’ group, with a sensitivity of 96% or higher; similarly a cut-point of 20 or higher yielded at least 92% sensitivity in all age groups in the development data set; in cross-sectional validation, sensitivity was estimated to be at least 94% across the age groups for the cut-point of 10/15 or more and at least 76% for 20 or more. Figure 1 illustrates the risk of PWID being HCV seropositive as a continuous function of the total score. Across all age groups, increasing scores were clearly associated with increased risk of HCV antibody positivity. Total score versus risk of hepatitis C virus (HCV) infection in cross-validation data set. A total of 61 HCV seroconversions were observed during follow-up, with an overall incidence rate of 45.8 per 100 person-years (95% CI 35.6 to 58.8) in our external prospective validation data set. Results from our prediction model were consistent with the previous results and had the acceptable validity (table 5). Higher number of risk factors associated with increased risk of HCV seropositivity compared two or less risk factors (reference) (HR 1.10, 95% CI 0.74 to 1.60, HR 1.15, 95% CI 0.78 to 1.65, HR 2.17, 95% CI 1.45 to 3.17 and HR 3.19, 95% CI 2.30 to 5.51 for three, four, five and six or more risk factors, respectively). 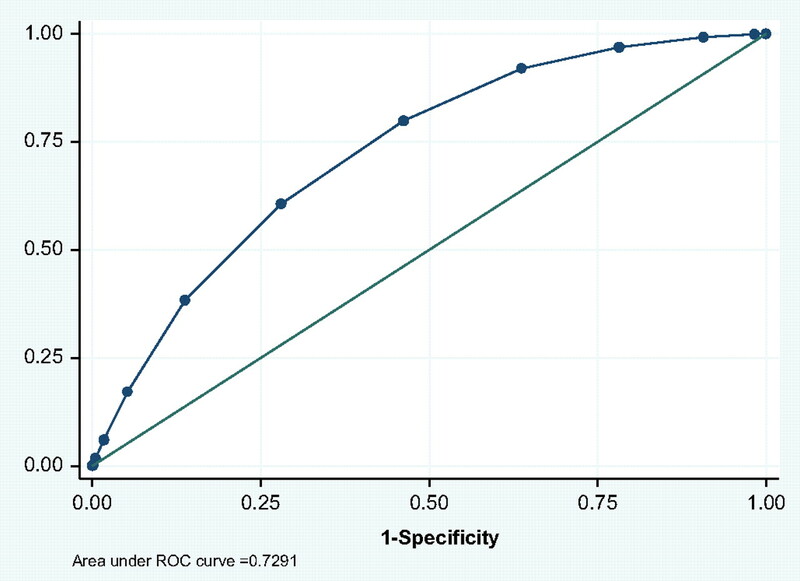 Overall sensitivity of the scoring tool was 73% sensitivity and 33% specificity (figure 2). Sensitivity/specificity for the prospective validation data set. ROC, receiver operating characteristic. In this study, we developed a scoring tool based on data from ∼16 000 PWID who attended ANSPS sites between 1998 and 2008. The tool was validated to more accurately identify those at increased risk of HCV infection. Current Australian guidelines recommend HCV antibody screening in all individuals with risk factors for infection regardless of patient characteristics and settings.28 Increasing the rate of HCV diagnosis and, in particular, diagnosis of acute infection and providing access to effective antiviral treatment has the potential to improve individual quality of life and reduce the burden of HCV infection. Being unaware of one's HCV serostatus has been identified as a major barrier to increasing HCV treatment uptake, including among PWID.29 30 While a relatively high proportion (64%) of participants in the ANSPS reported recent HCV testing, HCV antibody-negative respondents were less likely to do so than HCV antibody-positive respondents (60% vs 67%). One in five (20%) HCV antibody-negative participants had not been tested for HCV in the last 12 months, and a further 20% had never been tested (http://hiv.cms.med.unsw.edu.au/ (accessed August 2011)). This suggests that both uptake and frequency of testing could be improved. Although our scoring tool was developed for the prediction of current HCV diagnoses and not incident HCV in the future, strong consistency in risk factors for the prediction incident events of HCV was shown in prospective validation of the tool. Therefore, we expect that the same set of risk factors in our model plays an important role in the prediction of future HCV seroconversion. The intention of this study was not to identify a unique and specific cut-point of risk above which to target screening, but rather, to assess whether risk factors under consideration could predict those at increased risk accurately in order to consider the tool's use in facilitating increased screening. With a high background HCV prevalence of ∼70% among Australian PWID, all PWID should be screened for HCV. However, identification of just one of our listed risk factors substantially increased the likelihood of infection. Although Australia has screening guidelines for hepatitis C, current guidelines do not target specific attributes or injecting risk behaviours.28 By focusing on particular characteristics and specific high-risk behaviours, tools such as the one developed in this study may allow for more targeted identification of individuals at increased risk of infection. If used as a self-administered questionnaire, it is likely that respondents will answer more accurately.31 Since the vast majority of new HCV diagnoses in Australia are among people with a history of injecting drug use,20 this tool provides a valuable resource that could inform the establishment of more focused national screening guidelines. Furthermore, although current clinical practice guidelines recommend HCV screening of individuals with a history of injecting drugs, this recommendation focuses on a single risk factor (ie, injecting drug use), whereas considering the cumulative effect of multiple risk factors can more precisely identify people in need of additional non-routine screening. This is particularly pertinent in resource-constrained environments (including time-restricted clinical settings). Our methodology made use of a range of coexisting risk factors that were identified by a rigorous statistical approach in order to accurately identify the most relevant factors for HCV infection. Risk calculation approaches have been extensively used in decision-making about public health and clinical care and have even been proposed as an alternative to diagnosis for some diseases.32 Our risk calculation was based on a statistical method that yielded a systematic scoring system for carefully selected predictors, guided not only by numerical and scientific evidence but also by feasibility perspectives. We chose categorised variables that highlighted the important risk factors to motivate high-risk persons to be screened or to modify behaviours. This combination of factors may explain the enhanced properties of our scoring tool. Our study has several strengths, including being the first to validate a predictive model through internal cross-sectional and prospective data sets. Our prediction equation is based on 11 years of data and >16 000 participants. Ideal risk assessment methods or prediction models should be derived from large representative samples. The current study has several limitations. First, the study population is limited to those who participated in the ANSPS, which may result in selection bias. However, the ANSPS has been shown to be broadly representative of PWID attending NSPs.20 Second, we were not able to differentiate between acute, recent and chronic infections. Risk factor screening and identification allows for patients to be educated regarding the risks of injection drug use and needle sharing. Appropriate testing and diagnosis of HCV allows for the patient to be evaluated for treatment and receive counselling regarding HCV prevention. In addition to physician education, patient education campaigns must also be developed to increase patient compliance with testing recommendations made by their physicians. In conclusion, we believe that the screening tool described here will provide a simple and cost-effective method of identifying and alerting PWID who are in need of additional, non-routine HCV screening with notable predictive validity. A self-assessment method that helps individual PWID understand their relative increased risk of infection provides the basis for increased uptake of screening, diagnosis and antiviral treatment among this population. In summary, the tool described here has the potential to engage current PWID in timely and accurate risk analysis, potentially modifying risk behaviour, and increasing uptake of HCV screening and antiviral treatment in this population.
. Validation of a hepatitis C screening tool in primary care. Arch Intern Med 2008;168:2009–13.
. Risk of hepatitis C virus infection among young adult injecting drug users who share injecting equipment. Am J Epidemiol 2002;155:645–53.
. The prevalence of hepatitis C virus infection in the United States, 1998 through 1994. New Engl Med J 1999;341:556–62.
. Incidence and risk factors for hepatitis C among injection drug users in Baltimore, Maryland. J Clin Microbiol 1997;35:3274–7.
. Prevalence and incidence of hepatitis C virus infection among young adult injection drug users. J Acq Immune Defic Synd Hum Retrovirol 1998;18:11–19.
. Hepatitis C virus seroconversion among young injection drug users: relationships and risks. J Infect Dis 2002;186:1558–64.
. Hepatitis C virus infection among injection drug users: survival analysis of time to seroconversion. Epidemiology 2004;15:543–9.
. Sharing of drug preparation equipment as a risk factor for hepatitis C. Am J Public Health 2001;91:42–6.
. Hepatitis C virus acquisition among injecting drug users: a cohort analysis of a national repeated cross-sectional survey of needle and syringe program attendees in australia, 1995-2004. J Urban Health 2008;86:106–18.
. Incidence and risk factors for hepatitis C seroconversion in injecting drug users in Australia. Addiction 2006;101:1499–508.
. High hepatitis C incidence in new injecting drug users: a policy failure? Aust N Z J Public Health 2007;31:30–5.
. Incidence of hepatitis C virus infection among drug users during an outbreak of HIV infection. Can Med Assoc J 2001;165:889–95.
. Opportunities for prevention: hepatitis C prevalence and incidence in a cohort of young injection drug users. Hepatology 2002;36:737–42.
. Beyond prevention? Int J Drug Policy 2004;15:123–31. National Centre in HIV Epidemiology and Clinical Research. HIV/AIDS, viral hepatitis and sexually transmissible infections in Australia. Annual Surveillance Report 2009. Sydney, NSW: National Centre in HIV Epidemiology and Clinical Research, University of New South Wales. National Centre in HIV Epidemiology and Clinical Research (NCHECR). 2006. Estimates and projections of Hepatitis C virus epidemic in Australia. Hepatitis C Virus Projection Working Group, NCHECR, The University of New South Wales: Sydney, Australia. Available from: http://hiv.cms.med.unsw.edu.au/ (accessed August 2011).
. Acute hepatitis C: high rate of both spontaneous and treatment-induced viral clearance. Gastroenterology 2003;125:80–8.
. Peginterferon alfa-2b therapy in acute hepatitis C: impact of onset of therapy on sustained virologic response. Gastroenterology 2006;130:632–8.
. Effective treatment of injecting drug users with recently acquired hepatitis C virus infection. Gastroenterology 2010;138:123–35.
. Representativeness of injecting drug users who participate in HIV surveillance: results from Australia's Needle and Syringe Program Survey. J Acquir Immune Defic Syndr 2008;47:632–8.
. Transmission of hepatitis C virus: rates, routes, and cofactors. Epidemiol Rev 1996;18:137–48.
. HIV prevalence and risk behavior in needle exchange attenders: a national study. The Collaboration of Australian Needle Exchanges. Med J Aust 1997;166:237–40.
. Hepatitis C virus antibody prevalence among injecting drug users at selected needle and syringe programs in Australia, 1995-1997. Collaboration of Australian NSPs. Med J Aust 2000;172:57–61.
. Identifying individuals at high risk for diabetes: the Atherosclerosis Risk in Communities study. Diabetes Care 2005;28:2013–18.
. Analyzing Receiver Operating Characteristic Curves with SAS 2007. Cary, NC: SAS Institute.
. (2000) Evidence-Based Medicine: How to Practice and Teach EBM. (2nd edn). London: Churchill Livingstone.
. Estimating population attributable risk for hepatitis C seroconversion in injecting drug users in Australia: implications for prevention policy and planning. Addiction 2009;104:2049–56.
. Measuring effectiveness of needle and syringe exchange programs for prevention of HIV among injecting drug users: response to Amundsen. Addiction 2006;101:1834–6.
. Public health impact of antiviral therapy for hepatitis C in the United States. Hepatology 2009;50:1–6.
. Overcoming barriers to prevention, care, and treatment of hepatitis C in illicit drug users. CID 2005;40(Suppl 5):S276–85.
. Self reported risk behavior among injecting drug users: self versus assisted questionnaire completion. AIDS Care 2007;19:441–7.
. Against diagnosis. Ann Intern Med 2008;149:200–3. Funding The National Centre in HIV Epidemiology and Clinical Research is funded by the Australian Government Department of Health and Ageing, and is affiliated with the Faculty of Medicine, The University of New South Wales. The content of this publication is solely the responsibility of the authors and does not necessarily represent the official views of any of the institutions mentioned above. Ethics approval Ethical approval was obtained from the Human Research Ethics Committee (HREC) at the University of New South Wales as well as from relevant jurisdictional and site-specific HRECs. Contributors HW and LM implemented the study, analysed the data and wrote the first draft. LM, JI, LT and DW helped drafting, interpreting the data and finalising the manuscript. All authors saw and approved the final submitted version of the manuscript.